Ai Weiwei's clever protest against Lego. 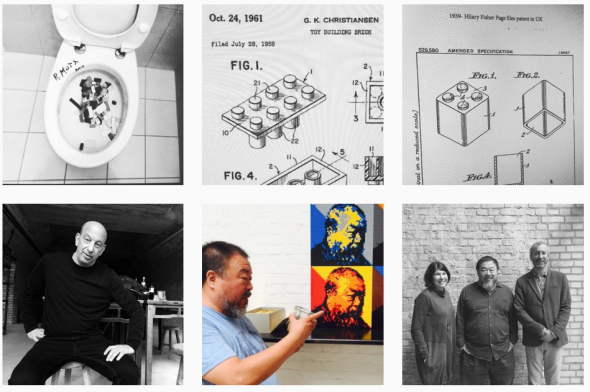 Social media provides Ai Weiwei with his canvas. Ai Weiwei counts among the most prominent multimedia artists, having worked with materials ranging from backpacks to bronze casts. Now, however, he’s run into a snag, after the Denmark-based Lego Group refused to honor a bulk order of bricks that he had planned to use in a coming exhibition. Though the company had provided him with pieces in the past, it declined to sell components to him for his new endeavor, citing political concerns. Deprived of one resource, Ai has proved that his real medium may be the Internet itself. After the initial denial, he went on to claim censorship, implicitly connecting the refusal to the recent announcement of a new Legoland in Shanghai. Though Lego Group representatives have been quick to remind reporters that the company no longer owns the rights to Legoland, the association stuck. Infuriated, many came forward offering their own Legos, and soon Ai was outlining an eccentric donation protocol that involves sliding bricks through the cracked sunroofs of luxury cars. Ai, for his own part, seems just as delighted by these naysayers by his more unambiguous supporters. On Twitter, he puckishly retweets affirmations and condemnations alike, apparently more interested in sustaining debate than in simply winning the day. At such moments he seems less like a source of controversy than its stage manager. Indeed, Alison Klayman, director of the documentary Ai Weiwei: Never Sorry, told me that Ai’s true artistic gift resides in his ability “to react in a timely fashion that invites participation.” It may be here that his ambitions shine through, this relatively small dilemma offering him an outsized means of dramatizing his larger concerns. By protesting Lego with Ai, his followers may be letting themselves become part of his artistic toolkit. Where Ai is concerned, the individual artwork is indistinguishable from the larger work of protest. As such, his social media complaints can be understood as examples of both his political practice and his creative endeavors. For Ai, Instagram isn’t just a venue for distributing his latest photographs; it’s a medium in its own right. Likewise, Twitter is a way of orchestrating his followers, not simply communicating with them. More than almost any other prominent artist, Ai takes social media as his basic form of expression. “The Internet is like my canvas,” he told the New York Times. Social media, by extension, would be his brush. Perl points to Ai’s 2007 Fairytale, describing it as a “quintessential work of social engagement involved bringing to Kassel 1,001 Chinese citizens who under normal circumstances had little or no chance of ever leaving the country to spend some time in Germany.” Though it lacks a title, Ai’s Lego protest feels no less deliberate—and no less productively ambiguous. As with Fairytale, it’s not entirely clear what we’re supposed to take from this project, especially when he retweets messages of skeptical condescension side by side with those of uncritical support. All of this suggests the troubling, and arguably charming, possibility that we’re already part of Ai’s work and world. Every tweet, every article—even this one, no doubt—is another brick, one more piece in a portrait still emerging.